Commandaria, which is one of the best Cypriot wines, is a sweet dessert wine, produced in Cyprus for millenia, made from sundried grapes, xynisteri and mavro (black). During my recent trip to Cyprus we took a trip to my brother in law’s village, Vassa. On our way, we passed from my mother’s village which is called Kyvides and is on the road which leads to the “krassohoria” which is the wine producing area of Limassol. The settlement of Pano Kyvides, according to the Great Cyprus Encyclopaedia, “existed at least from the Frankish period” and is linked to the medieval family de Quevides. The old village of Kyvides was destroyed by a major earthquake and the new village Pano Kyvides was built 3 km east of the old village in 1970 because of continuous landslips. As you may see from the collage the village has lots of new houses because it has a lovely climate and because of its proximity to Limassol, a lot of families build their summer or permanent houses there. In the collage above, the monument of the old lady on the top left-hand side is the sculptured bust of a heroess, Aggeliki Sotiriou, known by the name Philimon, a woman fighter of Cyprus liberating fight of 1955-59, which is situated next to the medieval chapel of Stavrou (chapel of the Holy Cross), on a hill, just outside the village, picture on bottom left and the kafeneio (coffee shop) she used to own, bottom right corner of the picture. Lemesos (Limassol) district is the center of the wine trade and wine making in Cyprus. The cultivation of the vine in Cyprus is as ancient as the roots of the people of Cyprus. The cultivation of the vine in Lemesos is also as ancient as the Kingdom of Amathus and Curium many centuries B.C. It is a well known fact, confirmed by various historical references, that wine has been produced in Cyprus for over 4,000 years until now. Ancient people, worshippers of nature and beauty, chose the famous wine producing island of Cyprus as the center for the adoration of Aphrodite the Goddess of fertility and love and of Dionysus the God of wine. From the beginning almost all exports of wine and spirits were made from the port of Limassol (Lemesos). Also in Lemesos there exists the region of Commandaria (in Greek Κουμανδαρία), which is a de Facto wine with an appellation of origin. The method of making commandaria is basically the same today as it used to be many centuries ago. Also in the Lemesos district there are the two well known vine areas for the production of the quality table wines, Krasohoria and Pitsilia. Lemesos is commonly recognized as the wine-making town of Cyprus and every September there is a Wine Festival taking place in the Municipal Garden. In 1987 the International Office of the Vine and Wine (O.I.V.) made a suggestion to declare Lemesos as the “City of Vine and Wine”. The same year on October 31, during the General Assembly of the International Office of the Vine and Wine, which took place at Marino in Italy, Lemesos (Limassol) was declared as the “City of Vine and Wine” and the president of the International Office of the Vine and Wine, Mr. Mario Fregoni, awarded a medal and diploma to the Mayor of Lemesos. Commandaria, which is one of the best Cypriot wines, is a sweet dessert wine, produced in Cyprus for millenia, made from sundried grapes, xynisteri and mavro (black). In fact it has been documented since the 8thcentury b.C., by the Greek poet Hesiod, who named it Cypriot Manna. The name Commandaria was given much later, during the 12thcentury A.D. Thus it has the distinction of being the world’s oldest named wine still in production. The history of this wine is that during the crusades, Richard the Lionheart, on his way to the holy lands in 1191, had to stay on the island after great thunderstorm. He and his men disembarked at the port of Limassol where he stayed and soon conquered the island.He built his castle in Colossi (my maternal grandmother was from this village) and during his wedding with Berengaria, they greatly enjoyed this local red wine. Richard the Lionheart pronounced Commandaria as the “wine of the kings and the king of the wines”. By the end of the century, he sold the island to the Templar Knights, who then sold it to Guy de Lusignan.However, they kept a large feudal estate close to Limassol, where they would cultivate vines. This estate was referred to as “La Grande Commanderie”, to distinguish it from two other smaller estates, one close to Paphos and the other near Kyrenia.The knights learned to produce this local wine and when they started exporting it to the royal courts of Europe, it was then referred to as the wine of the Commanderie, which then became known as Commandaria and the area where it was produced is now known as the Coumadaria region. It has been ascertained that in the 15th century vines from Cyprus were planted in Madeira by the Portuguese, whence the Madeira wine has been produced, similar to the Cyprus “Commandaria”. This information is also written on the bottles of Madeira wine. Something similar is the case of the Hungarian Tokay wine which is similar to a good “Commandaria”. The Marsala wine also seems to be a copy of “Commandaria”. Thibaut IV the most renowned Count of Champagne, returning from the Crusades came to Cyprus to visit his cousin, Alice, Queen of Cyprus. In Cyprus it seems he was overwhelmed by its vineyards, its wines and its roses because it was looked upon as the most acceptable and covered present to be given, vine and roses. The vines were planted in the area of the Marne and from these grapes the world-famous Champagne was produced. Sources: Wikipedia, Limassol Municipality, Pano Kyvides Community, Cyprus Wine Museum, Google Maps, Touristmaker. Pork with Prunes is a classic recipe of Northern Greece, which is a perfect dish for the holidays, especially for Christmas. I made this recipe with Pork with Prunes during last summer, when I was experimenting a lot with poached fruit and wine. I have experimented with Commandaria a lot of times, although I have not posted many recipes. I cooked the pork in a sautéing pan together with leeks and onions and deglazed it with Commandaria wine and cranberry juice. The plumbs were poached separately and some of them were added to the dish when it was almost cooked. After cooking the meat, it was removed from the sautéing pan and everything in the sautéing pan was pureed in a food processor.I then prepared a roux and added the pureed ingredients to make the sauce, to which I added the meat again. Wash and cut the meat into 1 cm thick pieces. Drain and season with salt and pepper. Heat the olive oil and sauté the meat. Turn once and add the onion, garlic and leeks and sauté until translucent. Add the peppercorns, allspice berries and bay leaf. Add the wine, stir for a few minutes and add the cranberry juice and enough water to cover the meat. Cover with lid, lower heat and simmer until meat is cooked, about 30 minutes. In the meantime, in a non-stick frying pan add 1 tablespoon olive oil and sauté the spices. Add the plums and mix for 1 minute. Add the wine and cranberry juice and boil on high heat until it is reduced to half (about ½ hour) mixing every now and then. Ten minutes before the end discard bay leaf and add the cooked plums. Remove meat to a platter. In a food processor add the plums and the sauce and puree. Return back to the pan and add the meat. Serve with Rice Pilaf. (For a more festive dish, you can mix in some pomegranate seeds and finely chopped parsley in the rice). 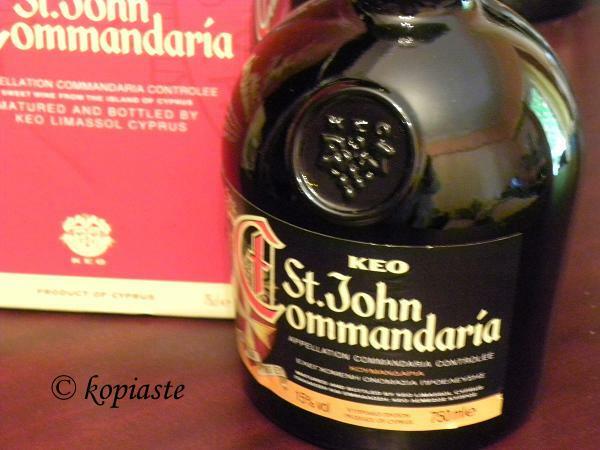 Commandaria, which is one of the best Cypriot wines, is a sweet dessert wine, produced in Cyprus for millenia, made from sundried grapes, xynisteri and mavro (black). Pork with Prunes is a classic recipe of Northern Greece, which is a perfect dish for the holidays, especially for Christmas. dear ivy,i learn a lot of history and geography with you!thank you so much!i love this post,is so special with returns in time and places,beautiful phottos…and the food is awesome,too. on the other hand,i try to sent the message haiti at this number,but is not possible…i wiil read about other possibilities! Alison, I have sent them an e-mail and I shall let you know when they reply tome. The rice pork dish with plum sauce looks heavenly! Commandaria sounds like port wine, not sure I could find it there. Angie I suppose you could use port as a substitute or madeira and for my Greek readers Mavrodaphne. I really enjoyed reading this. You’ve put so much work into this post and it’s incredible. I will have to look for Commandaria this week. Thanks Cheryl. I don't think you will have problem finding Commandaria. I get it from Sklavenitis and Marinopoulos. Thanks for sharing! Very interesting. Your dish must taste divine! Oh Ivy, how I would love to taste this wine. You post is enlightening as always. Thank you. Ivy what a great post and thanks for all this lovely information and photos you have shared with us. I shall see if I can get that wine in Austria. Your recipe sounds amazing and please e-mail me the recipe and I will try it with dried prunes. Ivy mon amie, merci pour tous ces beaux voyages que tu fais faire à travers le temps et l'espace. J'aimerai bien goûter à ce nectar que tu décris si bien. Ciao Wonderful Ivy ! You must be part of the touristic ministry ! I wish I could visit greece and Cyprus today !! Your recipe sound and look heavenly !! Very interesting article Ivy! Is this a crusader castle up there? If so it is remarkably well preserved! How wonderful to have a wine that has managed to be produced for so long! I would love to try it! Myabe it is sold in Beirut? Yes Joumana, it is a medieval castle and quite well preserved. I am not sure if you can find it in Beirut but if you visit Cyprus you should definitely try it. Ivy, I refer your site for all things from Cyprus. It's on my list and your report back from "home" pushes the itinerary up. As usual a beautiful dish! I enjpy all your stories about travel, history and culture that you share with us! Thanks for the interesting background Ivy. Your pork dish looks and sounds amazing! I have a brand new bottle of Commandaria sitting on our bar shelf waiting to be openened! It is begging me to make something with it … this looks great Ivy. The plum with the sweet wine must be a perfect match. Thanks Maria. Enjoy it with your husband! Ivy – I love traveling Europe through your blog! Thank you for introducing me to yet another region that I'd love to visit. Looks like Mike and I are going to keep fighting about where to have our honeymoon for a little while yet! Ivy I loved your post, I learned so much! I loved the history of the wine. I want to try this wine now! I really enjoyed reading the history of this wine and your dish sounds incredible! The pork must be so flavorful braised in Commandaria! What an interesting history of vines from Cyprus! The sauce made with the wine sounds delicious too. J'aime beaucoup toutes les explications que tu donnes sur les produits que tu nous présentes. Le côté historique me passionne toujours. Ton plat me semble très goûteux. Ivy mon amie, cette recette est formidable! J'ai un prix pour toi sur mon blog. Dear Ivy, I found your website about one week ago. I am so glad that I did. I have made so many of your recipes already. My children and I absolutely love your recipe for avgolemono. My parents are from Cyprus and my sisters and I were born in Australia. I recognise so many of these recipes from my childhood and I am so excited to be cooking them for my little ones. These were made for us with much love by our grandparents and your recipes are so authentic. I have almost felt teary at some of the smells I have been conjuring up in the kitchen this week! So I will continue to cook up all these memories for my family and I thank you for publishing them. I noticed in this post you mention a cook book. Do you have some available to purchase? I would love to purchase one. My sisters and I thought many of these recipes were lost to us forever and felt a little sad they were not taught to us. Not anymore! May God continue to bless you so that you may continue to bless others with your wonderful recipes! Thank you so much Jules. Shall send you a private rmessage.